Almost everyone on earth knows that Walmart is the world’s largest retailer and many know that it was started by Sam Walton in Northwest Arkansas, but how did this colossal empire begin? In 1962, Rogers, a town of about 6500 and growing had recently become the home of Daisy Manufacturing and nearby Beaver Lake was under construction. All of the retail businesses were located downtown and consisted mainly of small family owned stores including Stroud’s, Hunt’s, Otasco, Western Auto, Rogers Hardware, and Sterling’s and Russell’s 5¢ and 10¢ Stores. Sam Walton lived next door in Bentonville and by 1962 had used his remarkable business skills to build a chain of 16 variety stores in Arkansas and the surrounding states. Fifteen of these stores were Ben Franklin chain stores and one was independent. A radical new concept originated about that time in the nation – discount stores with discount prices, name brand merchandise, large volume, and emphasis on customer service. Sam was intrigued by this idea and decided to try an experiment. He and his wife, Helen, opened the first Walmart in Rogers in 1962 using the new concept. That same year, K-Mart and Target also began in other parts of the country, but with different business ideas and clientel. Almost everyone on earth knows that Walmart is the world’s largest retailer and many know that it was started by Sam Walton in Northwest Arkansas, but how did this colossal empire begin? In 1962, Rogers, a town of about 6500 and growing had recently become the home of Daisy Manufacturing and nearby Beaver Lake was under construction. All of the retail businesses were located downtown and consisted mainly of small family owned stores including Stroud’s, Hunt’s, Otasco, Western Auto, Rogers Hardware, and Sterling’s and Russell’s 5¢ and 10¢ Stores. A radical new concept originated about that time in the nation – discount stores with discount prices, name brand merchandise, large volume, and emphasis on customer service. Sam was intrigued by this idea and decided to try an experiment. He and his wife, Helen, opened the first Walmart in Rogers in 1962 using the new concept. That same year, K-Mart and Target also began in other parts of the country, but with different business ideas and clientel. After a few months, Sam Walton promoted Don Whitaker to upper management and in early 1963, brought Clarence Leis to manage the first store. 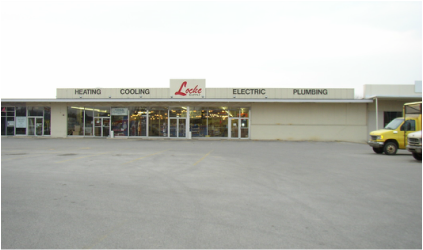 Leis had been the manager of a Walton Ben Franklin store in Coffeeville, Kansas. Since the discount concept was a new idea, there was no pattern to copy. Everything was new and had to be developed including buying merchandise in volume, pricing, displaying, bookkeeping and return policies. By 1964, the system had been developed to the point that profits began to surge, and Walton began opening new Walmarts after the Rogers’ pattern. Business was so good on Saturday afternoons that the limited store personnel were overwhelmed, and Leis would call in his wife and children to help run the registers or do whatever was required (at no pay). Clarence spoke to the Rogers History Club a couple of years ago and told stories about managing the first store. “When someone would return an item like a lawn mower, I would take it home and repair it, then bring it back to the store for resale.” Another story was about the spring that was in the basement. “There was a sump and a pump to keep the water pumped out. The cold clear water in the sump was perfect for minnows. My assistant manager, Charlie Cate, and I kept minnows in the basement and when we had time, we would take off at lunch and go to Lake Atalanta and fish.” He also told about taking the days’ receipts home after work and counting the money on his kitchen table before taking it to the bank to deposit. Sam Walton opened Walmart stores in small towns across Arkansas and eventually the nation. Clarence Leis managed Store No. 1 in the 1960s and 1970s when it was the flagship and training store for new managers and leaders of the chain. Many local folks blame Walmart for the decline of small businesses in downtown Rogers, but this is not accurate. In the 1960s the face of retail shopping was changing in Rogers and all across the nation. Shopping centers with lots of free parking, discount stores and supermarkets were popping up nationwide. Gradually in the mid-1970s, the family owned businesses in Rogers and downtowns around the country began to close. The building that was the home of the first Walmart Store is now Locke Supply Co. Photo by James Hales in 2006. 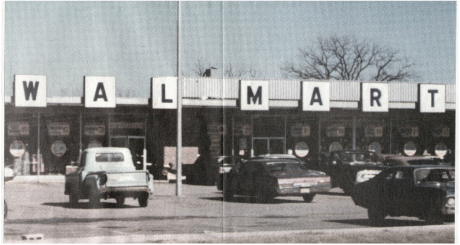 The first Walmart in the 1960s at 719 W.Walnut, Rogers.